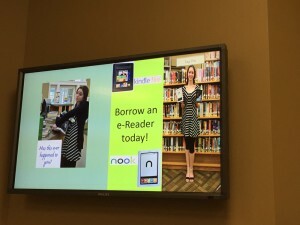 As the role of local libraries morphs once again, it is interesting to see how many of them are adopting digital signs as a communication tool to disseminate information to their constituents/patrons. With more and more services being offered by libraries these days, way beyond the traditional lending of books, CDs and movies, the need for up to the minute communication becomes essential to maintain their relevance in our ever more digital / on-line world. Digital signage can play a major role in this communication process as well as demonstrating a “green” environment for their patrons. Information can be displayed to the public in meeting rooms, at the front desk, in vestibules or cafeterias/cafes. The messaging can range from programs being held at the library to public service announcements to emergency messaging and so much more. What is really encouraging is the relatively non-complicated and inexpensive path to adoption that is available to them. Take our local Patterson Library in Patterson, New York, for instance. 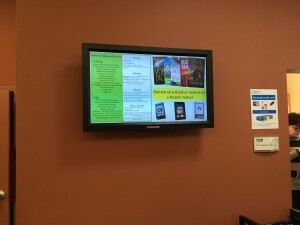 During a major renovation project in 2011-2012, the library decided to employ digital signage in their community room, their cafe and their children’s program area. They shopped for screens and purchased three at cost from a major manufacturer because of their non-profit status. The distribution equipment (ComQi) , CMS and player (Kramer Electronics) were purchased by a local vendor and donated to the library. Even if they weren’t able to get the equipment donated, the cost for several commercial screens with CMS player software can still be well under $2,500. Like any digital signage installation, the key to success is keeping the content current, applicable and fresh. 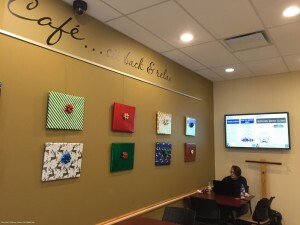 The messages are simple, using many of the existing images used in other communication tools (Newsletters, Bulletin Boards, Facebook, etc.…) and re-purposed for the digital signage screens. Content is looped through the zones on the screens and updated on a regular basis. The screens double as TV’s for local broadcasts, presentation screens for programs, trainings, and DVDs/ movies played for an audience. When not in use by the programs, the screens advertise upcoming events, highlight past events and display other community goings on. 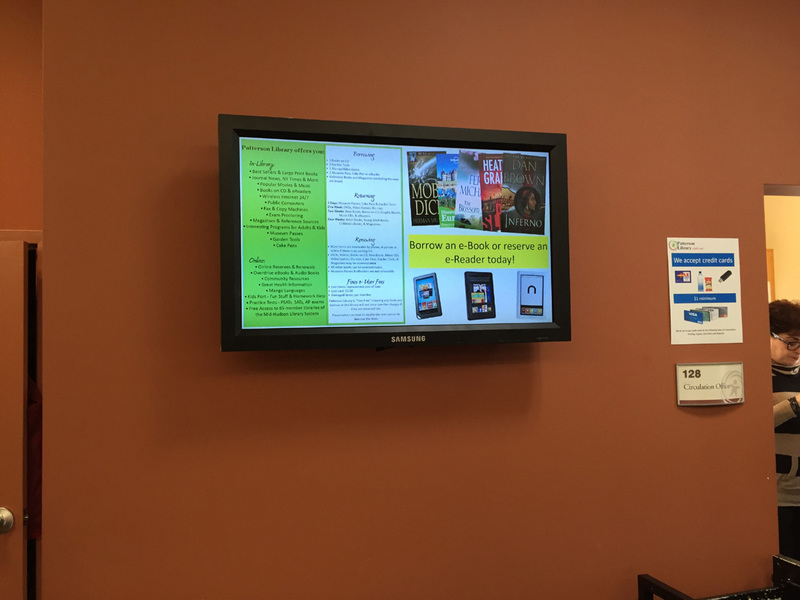 The library in Patterson recently added a fourth screen and second player to be used for disseminating information at the front circulation desk. 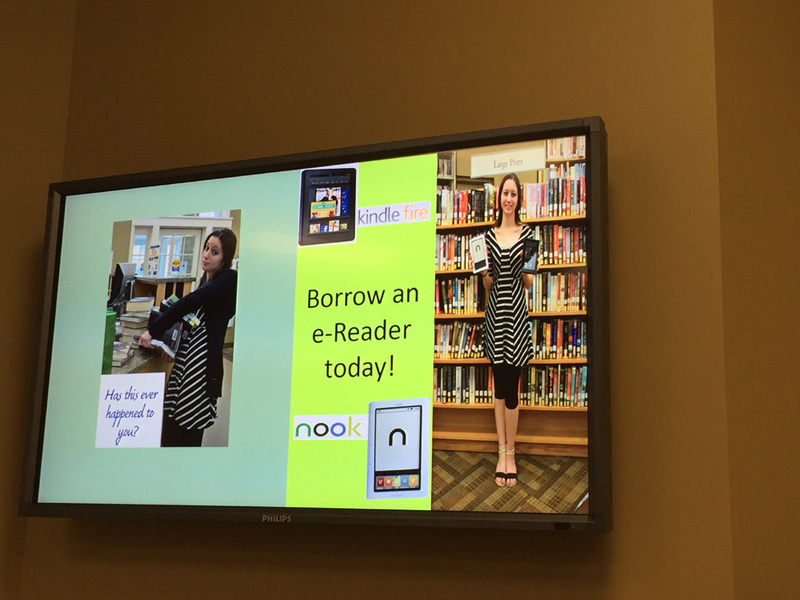 The content can either be the same as the content on the other screens or it can be different, giving the library a tremendous amount of flexibility in the messaging to their patrons.